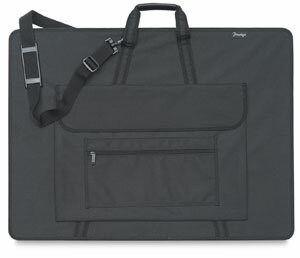 Designed to provide many years of dependable use, Alvin's rugged Elegance Portfolio is made of laminated nylon for exceptional durability and strength. Its storage options are phenomenal. Enjoy a 4” wide gusset and two full-width interior pockets, a 5” × 17” interior pencil/brush storage case and a large exterior front pocket that measures 14” × 21” × 2”. The portfolio also includes smaller zip pockets for little extras, protective chrome studs on the bottom, comfortable dual handles, and a detachable shoulder strap.